After reading Viv’s write up and then Laura’s review about Monsoon’s new dim sum menu, I was excited to check it out. It’s been years since I last ate at Monsoon, but I can still vividly recall their incredible wok-fried Dungeness crab in spicy, garlicky, black bean sauce. I’m not sure why Monsoon fell off my radar—especially because it’s only a few blocks away, but it was high time for a reunion. Monsoon’s website said they opened at 9am for breakfast service, so I arranged to meet some friends there at 9:30am. Unfortunately, Monsoon doesn’t actually open until 10am. We sat across the street at Fuel to wait. It felt a little bit like stalking. At 10am we rushed back across the street to claim a table front and center. I had forgotten how cute the place is—very stark and modern, but in a comfortable way. I was feeling a little groggy from the night before, so we ordered a round of green apple mimosas. They appeared to be “fresh squeezed” and the green apple was sour and bright (i.e. not artificially flavored). Something in the apple made the champagne foam up in a strange way, but they were delicious. Vegetable potstickers – A traditional pot sticker, perfectly steamed and sautÃ©ed, although not very interesting unless dipped in its salty, tangy sauce. 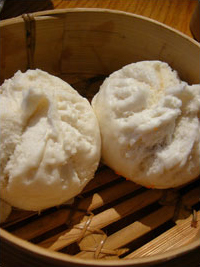 Steamed bbq pork buns (hum bow) – These looked beautiful, but tasted off. I prefer the sweet and savory hoisin-based “bbq” filling, but this filling tasted bean-based and was dry and chalky. 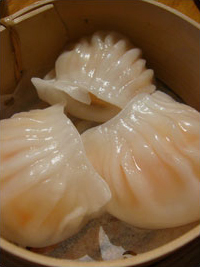 Shrimp dumplings – Perfectly formed dumplings with translucent skin. The shrimp filling was sweet and fresh, but the skins were undercooked or too thick. 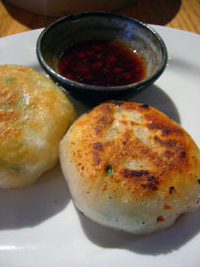 The result was terribly sticky and chewy dumplings. Pork shui mai with dried shiitake mushrooms – There were very pretty and topped with some sort of roe, but they tasted somewhat bland and non-descript. 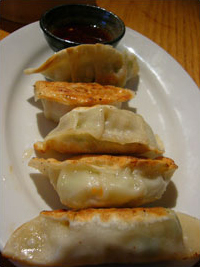 Crispy shrimp Chinese chive wontons – Large, round patties of minced shrimp and chives, wrapped in a rice dough and fried until crisp and lightly browned (nothing like Chinese wontons). These were savory and juicy; by far my favorite item we tried. We also ordered one breakfast from the non-dim-sum menu: Duck Eggs with Shallot and Chanterelles ($11). In theory, this sounds amazing. In practice, it was somewhat bland. The duck eggs were creamy and fluffy, but I wanted them to taste more exotic. 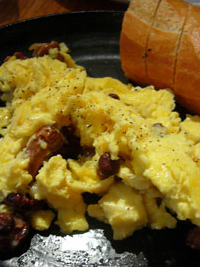 I also wanted more Chanterelles in the eggs. Overall, the breakfast left me wanting for a trip to Sun Ya. I missed the noisy, crowded room with the carts of steaming goodies rattling by. I missed the sometimes fatty and sometimes grisly dim sum. More than anything, I missed the flavor. Monsoon dim sum seemed a bit toned down and flattened for the American palate, but it would be a great place for dim sum beginners… or the culinarily squeamish. Which isn’t to say that I wouldn’t go back. I really do want to try the pan fried daikon cakes (which looked amazing), the duck congee and the Vietnamese soups (pho). Also, for dessert we happened to have one of the best (coconut) flans I’ve ever tasted. That alone would be worth a trip back. Plus Chef Eric Banh is very, very sweet. And smokin’ hot. Actually, what I’d really like is to return for dinner; this seems to be where Monsoon excels. Hi, after reading your blog, the book publisher (situated in Northern California) that I work for would like to send you a review copy of a food memoir. Is there an e-mail address or snail-mail address that we can use to contact you more efficiently? We will not use your e-mail address for purposes beyond the sending of the review copy. Thanks Jenny, I will contact you directly. hi meg! reid at onokinegrindz had a similar experience—he ended up waiting at fuel only to be underwhelmed as well. CF – Well, this is just my personal preference, and what I’ve become accustomed to. 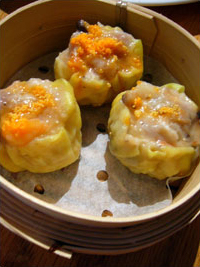 I’ve been eating dim sum since I was a little kid, so I’m used to the full flavor that comes with a bit of fat. Yes, I’m always on the hunt for more dim sum places. Let’s go check them out! I actually did see Reid’s review—and was shocked that we had such a similar experience. Although I feel bad for him; he came all the way from Hawaii to eat here. I just walked down the street! oh tragedy! I love (love!) Monsoon and am sad to read such a dismal report from you. I will stick to dinner since Monsoon does still rock the house that way. FYI tip on dim sum…on MLK (down a ways, maybe Orca) is a place which was once called Saigon Dynasty and now is called Jade Palace. I have had some great dim sum there and very inexpensive…gai lan cooked perfectly with the obligatory oyster sauce is perfect along with great typical faves like shu mai and har gow. AND yes, it is a Vietnamese place and it is huge! Kind of a weirdo place and I think that helps me like it that much ore too. Sorry you had a bad experience here too. I actually ended up going into Fuel Coffee across the street because when I arrived, the place wasn’t open either! ARGH! I see that nothing has changed since I was there, but then again, the waitress kind of made a comment about just starting dim sum and having to work out the kinks. I did hear that the food there during dinner is great and I also heard that the sandwiches at Bahn’s other shop, Baguette Box, are amazing. Have you been there? I share your sentiment. I was sad as well and really wanted to love Monsoon’s dim sum. I mean it definitely was passable and much better than some dim sum I’ve had in the past, but I think I was missing the whole dim sum experience. Thanks for the tip about Jade Palace—I will definitely check that out! Hi Reid, Sorry you didn’t have a good experience either. Although next time you’re in Seattle it might be worth checking out Monsoon for dinner. I LOVE their other place. Baguette Box is close to work and I try to eat there at least once a week. They have the most amazing salami sandwich with pickled daikon and caramelized onions. Mmmmm. That eGullet forum is great—I hadn’t seen it yet! I’m dying to know what bacon dessert he ends up making. Wanting to wish you and yours a Happy Holiday Season.. Take care and be blessed. Thanks Shyloh! Same to you. One word, MOXIE! Laurie Carter’s food is superb. I should know I work there. Geoff Garza artist/waiter. MMM, so beautiful, so jealous. Madrid has a few dim-sum places, but nothing like that.